2008; Barton, Ester et al., 2009). must encode as many of the objects as they can into VWM. counting and grouping strategies (Figure 1). jects the average human could maintain in VWM was 3 - 4.
ms). Here, a set size of four and a probe array of one are represented. colored square stimuli, typically drawn from about 6 distinct hues. red), and thus require low resolution to make an accurate comparison. sample object and test probe. al., 2005), and with fMRI (Todd & Marois, 2005). level of similarity between the test and sample object is large. formance is limited by k, as with simple objects (Figure 1). resolution at which those objects are represented. Discrete or Flexible Resource Allocation? depend on the complexity of the other objects in the display. k, is reached (Anderson, Vogel et al., 2011). least for certain conditions (Sligte, Scholte et al., 2008). ganization of the visual system. al., 2000; McCollough, Machizawa et al., 2007). zawa et al., 2007; Gao, Li et al., 2009). plained by a rigid resource allocation model. 2008; Schummers, Yu et al., 2008; Chen & Parrish, 2009). al., 2000; Postle, Awh et al., 2004; Roth, Serences et al., 2006). 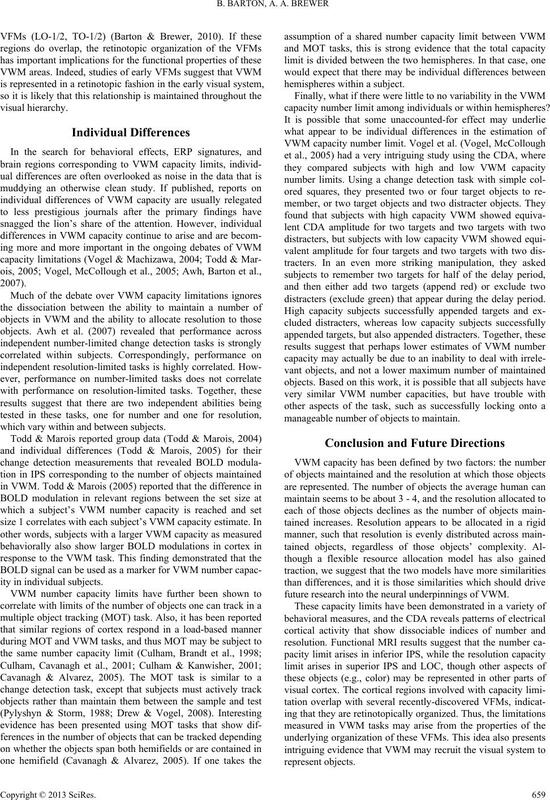 number and resolution limits on VWM capacity (Postle, 2006). 2009; Sligte, Scholte et al., 2009; Ester, Anderson et al., 2013). 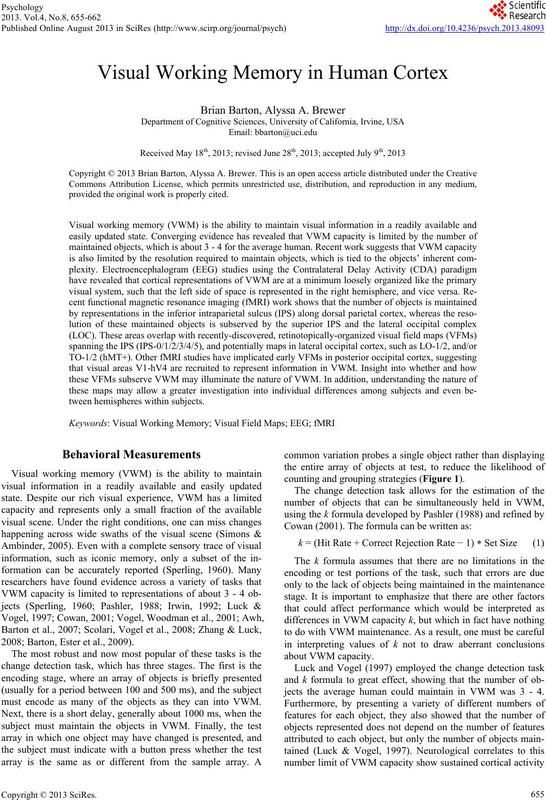 that VWM is a distributed aspect of the entire visual system. low-level processing of visual details (Tootell, Hadjikhani et al. et al., 2007; Brewer & Barton, 2012)). representation at the occipital pole (Schira, Tyler et al., 2009). Brewer et al., 2002; Brewer, Liu et al., 2005). Wandell, Dumoulin et al., 2007; Konen & Kastner, 2008). which vary within and between subjects. capacity number limit among individuals or within hemispheres? distracters (exclude green) that appear during the delay period. manageable number of objects to maintain. 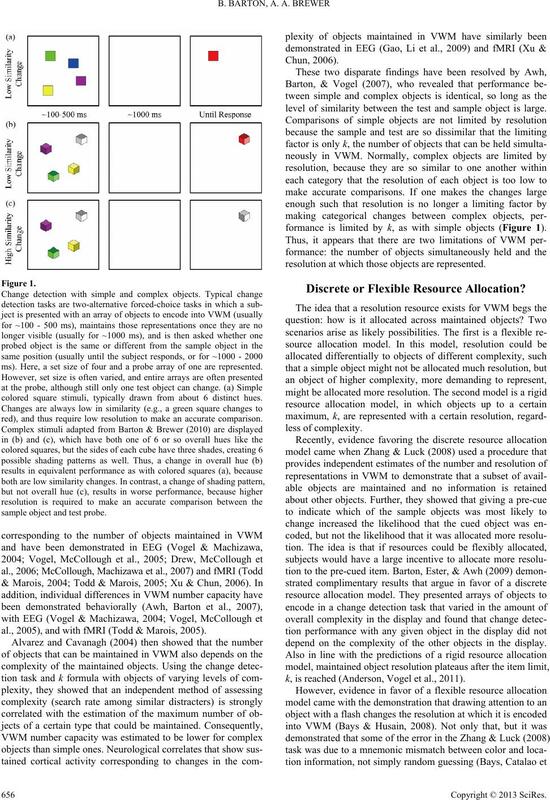 future research into the neural underpinnings of VWM. B.B. wrote the manuscript, which was then revised by B.B. of objects. Psychological Sc i e n c e , 15, 106-111.
complex. 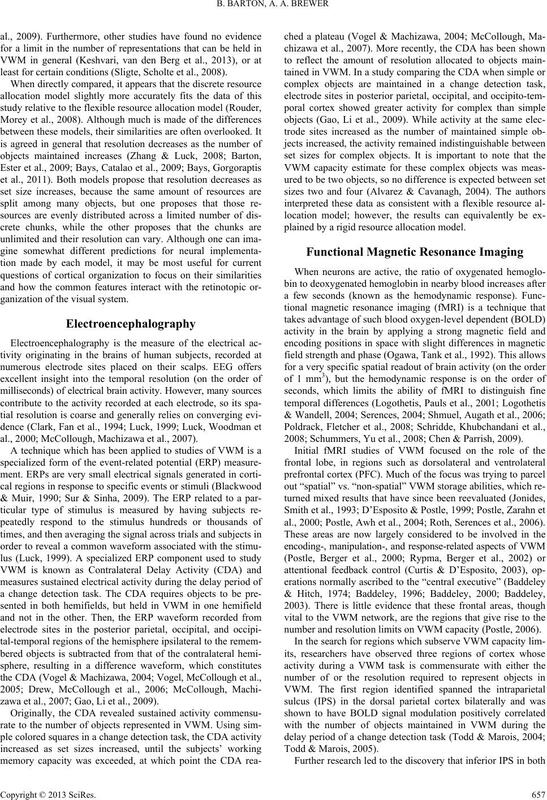 Journal of Neurophysiology , 102, 2704-2718.
ceeded. Journal of Neuros ci en c e, 31, 1128-1138.
ing memory? Trends in Cognitive Sciences, 4, 417-423.
forward. Nature Reviews Neuroscience, 4, 829-839. Baddeley, A. D., & Hitch, G. (1974). Working memory. In H. B. 89). Waltham, MA: Academic Press. caques. 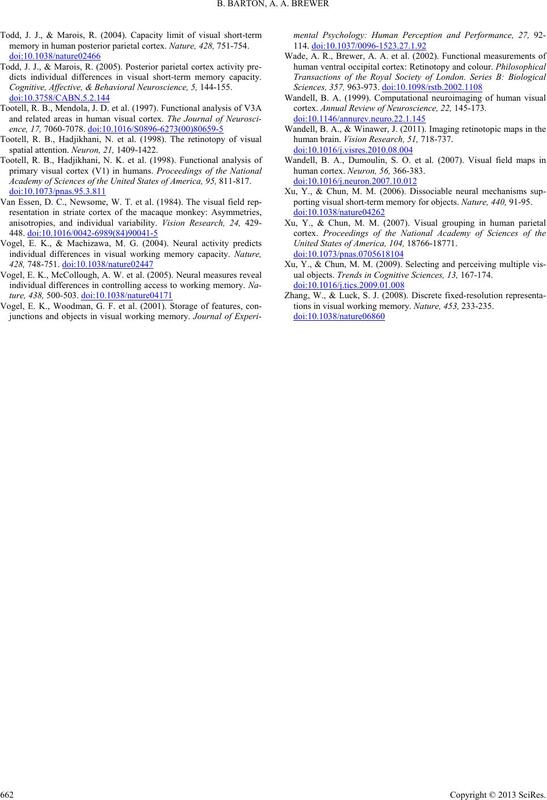 Journal of Neuroscienc e , 11, 168-190.
man Perception and Performance, 35 , 1359-1367.
memory resources in human vision. 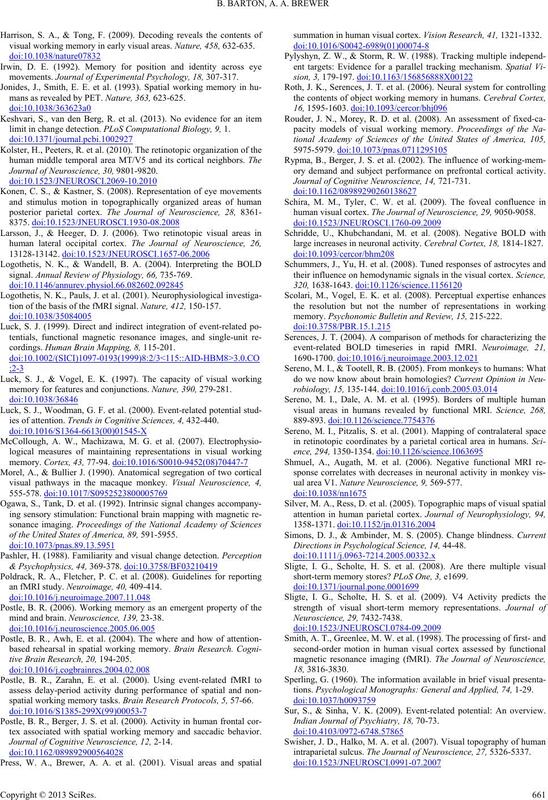 Science, 321, 851-854.
nal of Neuroscience, 22, 10416-10426.
multifocal attention. Trends in Cognitiv e S c ie n c e s , 9, 349-354.
variations of attentional load. Neuron, 32, 737-745.
tions and locations of visual areas V1/2/3 in human visual cortex. estimates in human visual cortex. Neuroimage, 39, 647-660.
tional MRI designs. Neuroi mage , 62, 1195-1200.
processing in the primate cerebral cortex. Cerebral Cortex, 1, 1-47.
visual working memory in early visual areas. Nature, 458, 632-635.
movements. Journal o f Experimental Psychology, 18, 307-317.
mans as revealed by PET. Nature, 363, 623-625.
limit in change detection. PLoS Computational B i ol ogy, 9, 1. Journal of Neuroscie n c e, 30, 9801-9820.
signal. Annual Revie w o f Physiology, 66, 735-769.
tion of the basis of the fMRI signal. Nature, 412, 150-157.
cordings. Human Brain Mapping, 8, 115-201.
memory for features and conjunctions. Nature, 390, 279-281.
ies of attention. Trends i n Cognitive Sciences, 4 , 432-440.
of the United States of America, 8 9 , 591-5955.
an fMRI study. Neuroimage, 40, 409-414.
mind and brain. Neuroscience, 139, 23-38.
tive Brain Research, 20, 194-205.
spatial working memory tasks. Brain Research Pr oto cols , 5, 57-66.
tex associated with spatial working memory and saccadic behavior. 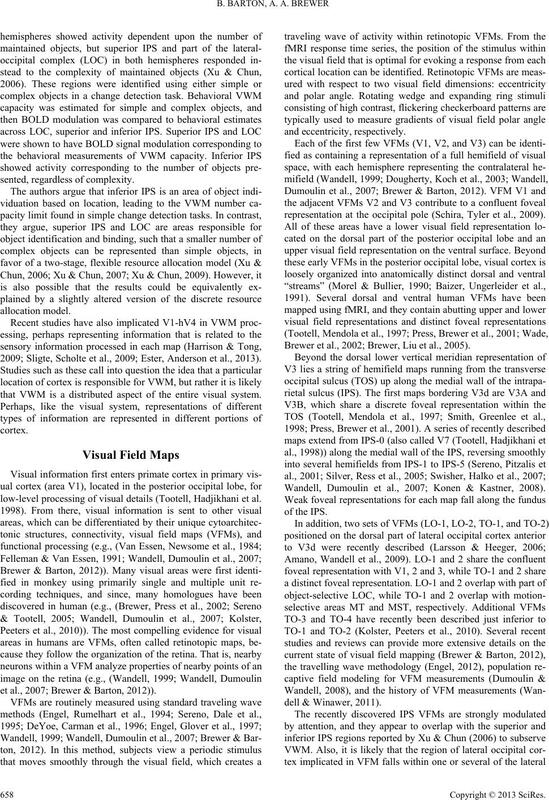 Journal of Cognitive Neuroscience, 12, 2-14.
summation in human visual cortex. Vision Research, 41, 1321-1332.
ory demand and subject performance on prefrontal cortical activity. Journal of Cognitive Neuroscience, 14, 721-731.
human visual cortex. The Journal of Neuroscience, 29, 9050-9058.
large increases in neuronal activity. Cerebral Cortex, 18, 1814-1827.
memory. 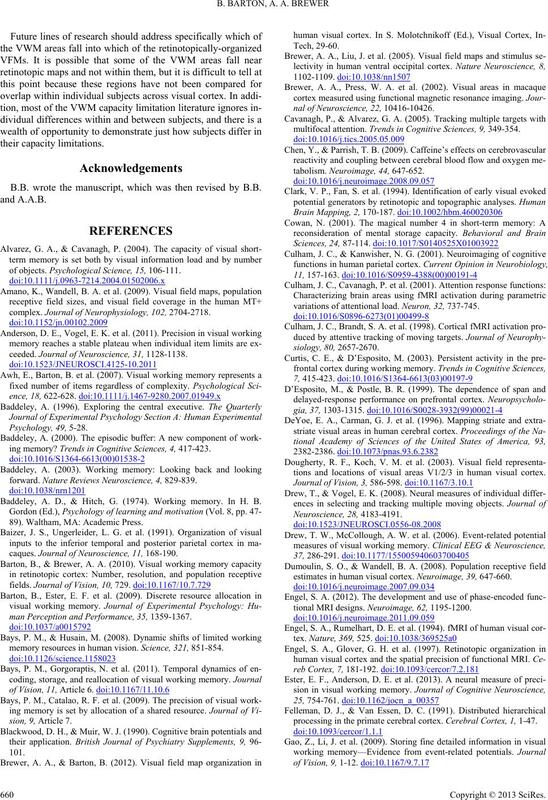 Psychonomic Bulletin and Review, 15, 215-222.
ual area V1. Nature Neuroscience, 9, 569-577. Directions in Psychological Sci e n c e , 14, 44-48.
short-term memory stores? PLoS One, 3, e1699. tions. Psychological Monographs: General and Applied, 74 , 1-29. Sur, S., & Sinha, V. K. (2009). Event-related potential: An overview. Indian Journal of Psychiatry, 18 , 70-73.
intraparietal sulcus. The Journal of Neuroscience, 27, 5326-5337.
memory in human posterior parietal cortex. Nature, 428, 751-754.
dicts individual differences in visual short-term memory capacity. Cognitive, Affective, & Behavioral Neuroscience, 5, 144-155.
spatial attention. Neuron, 21, 1409-1422. Academy of Sciences of the Unite d S t at e s o f America, 95, 811-817.
cortex. Annual Review of Neuroscience, 22, 145-173.
human brain. Vision Research, 51, 718-737.
human cortex. Neuron, 56, 366-383.
porting visual short-term memory for objects. Nature, 440, 91-95. United States of America, 104, 18766-18771.
ual objects. Trends in C ognitive Sciences, 13, 167-174.
tions in visual working memory. Nature, 453, 233-235.